Resides in Chicago, IL and helps run the Lakeview Go Club. 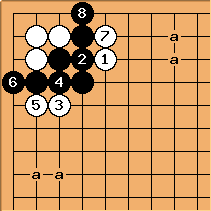 Learned Go in 2001 by the worst way possible, through Yahoo games. Strength is currently 2kyu KGS, 4kyu AGA. Note: The rating I give each book is not based on how good of a book I think it is, but rather how well I feel the book helped me to improve my play, which, considering my rank, is completely subjective! No matter how enthusiastic one is about Go, it is not possible to transfer this excitement to others unless the interest originates from that other person. When playing a new player on a small board, finish the entire game even if you are ahead by a lot. Assuming your opponent understands the game to be over and messing up a part of the board in order to review the game is a mistake, and can be taken as an offense. Don't play rated internet games when tired, drunk, or in a bad mood. Always shake hands after the game, it is good class. and are trick plays. 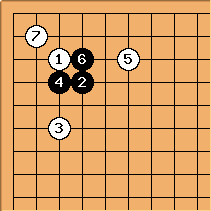 is a correct response but if B plays to try and capture the corner then uncovers the trick. The W group in the corner is alive while B is without a base and already pressured. Looks bleak for W after , but is a mistake. instead should be at b, keeping good shape, surrounding the W group, and W gets less territory than the 3-3 invasion would have produced. After , B has only one eye in the corner. W will likely extend to somewhere like a, and the other W group will be able to fend for itself. 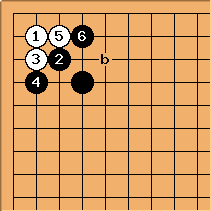 B is forced to run into the center and W will gain the initiative. There seems to be some disagreement over whether this is really bad for B or not.